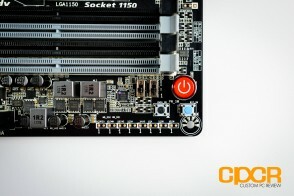 The $150 price category is particularly important because price conscious enthusiasts want a board that has a certain set of base features, but aren’t necessarily interested in the features offered by higher end, higher priced motherboards. The $200 category on the other hand is for those enthusiasts with a couple more bucks to spare, enjoy tweaking and tinkering with their hardware, and most importantly are interested in having a more feature rich motherboard that allow them to throw in additional storage and additional expansion cards down the line. 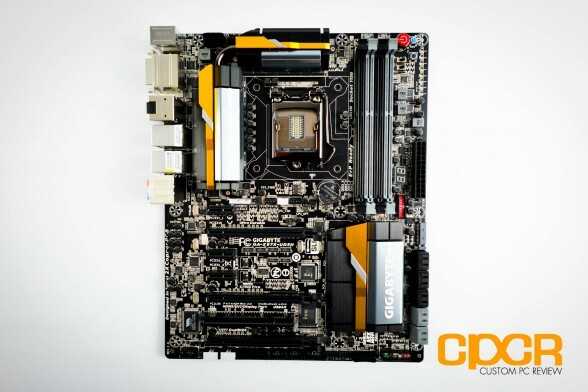 Finally, there’s also the flagship motherboards that aren’t necessarily the best sellers, but really show the enthusiast market what a motherboard manufacturer is capable of accomplishing when all cost factors are removed. Now today we’ll be reviewing the Gigabyte Z87X-UD5H, which is a motherboard that falls into the $200 range and looking at its feature set, it’s definitely quite competitive. Ready to take a closer look? Read on to the next page! Here’s a look at the packaging for the Gigabyte Z87X-UD5H. Included we get some documentation, a driver disk, a Gigabyte sticker, 6x SATA cables, a rear I/O shield, a SLI bridge and a 3.5″ front panel USB 3.0 adapter. 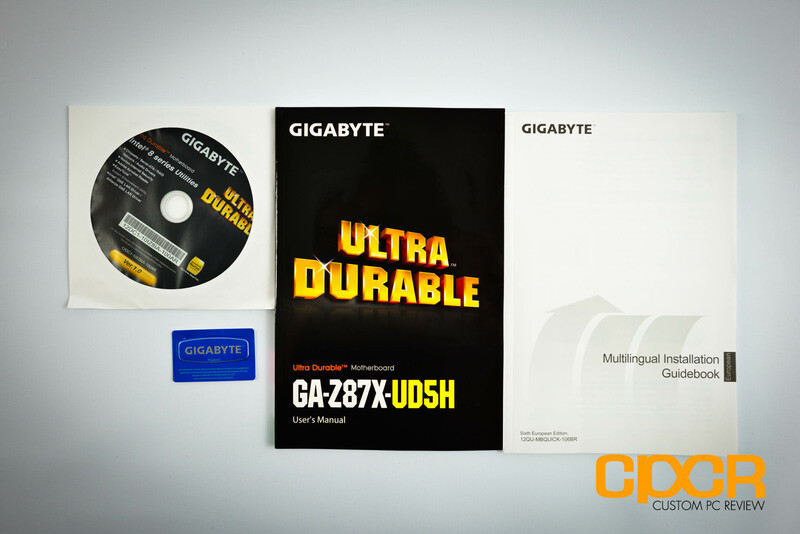 Here’s a look at the Gigabyte Z87X-UD5H itself. 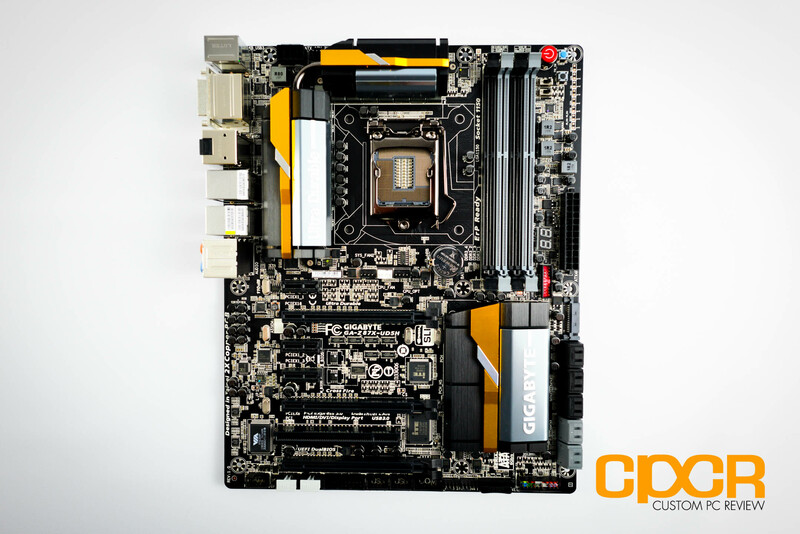 The Gigabyte Z87X-UD5H is an ATX formfactor motherboard which uses the Z87 chipset which supports Intel LGA 1150 socket processors. 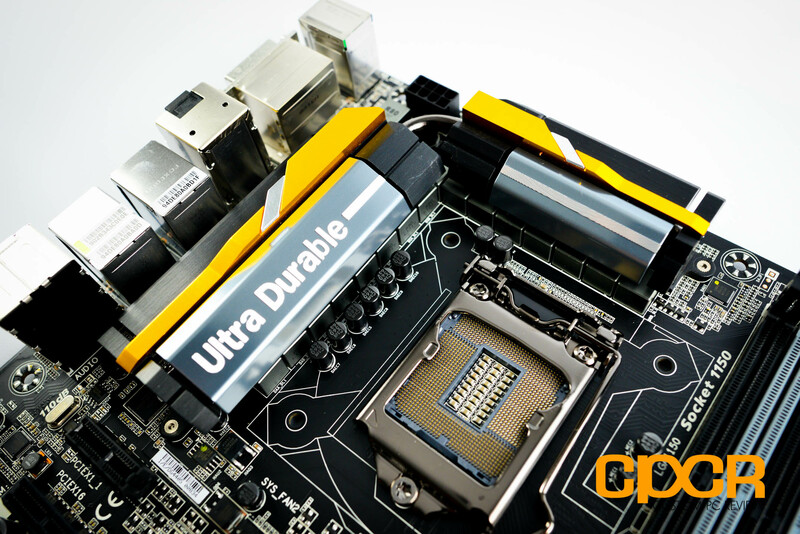 Carried over from the previous generation, Gigabyte has opted to use their slick looking, completely blacked out PCB and new for this generation is their massive heatsink with gold/silver accents. 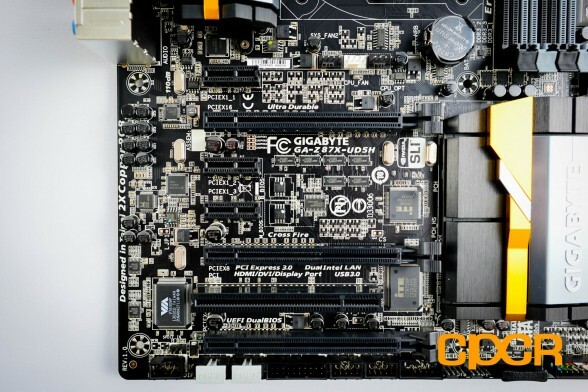 Taking a quick glance at the motherboard, we can already see that Gigabyte has done a great job with the Z87X-UD5H’s layout despite the plentiful amount of features onboard. Let’s take a closer look. 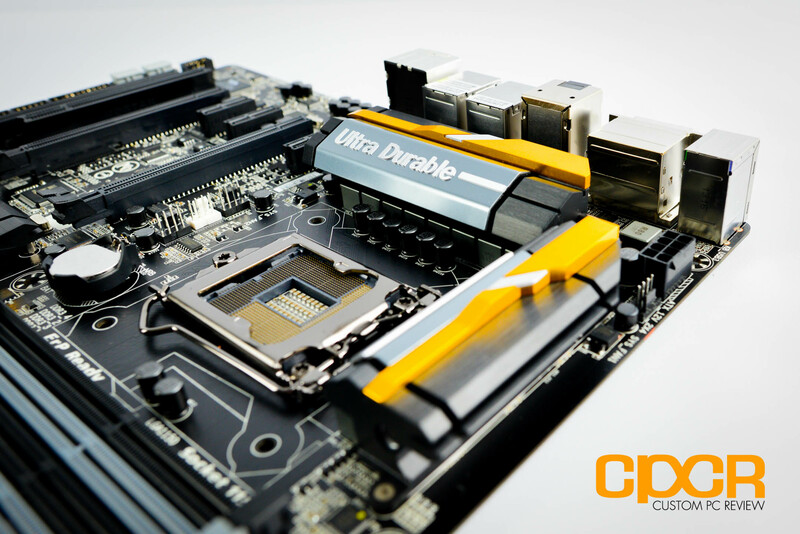 Here’s a look at the CPU socket along with the VRM area on the Gigabyte Z87X-UD5H. Since the Z87X-UD5H is a Intel Z87 chipset board, is includes a LGA 1150 socket which supports all the latest Intel Haswell based processors. 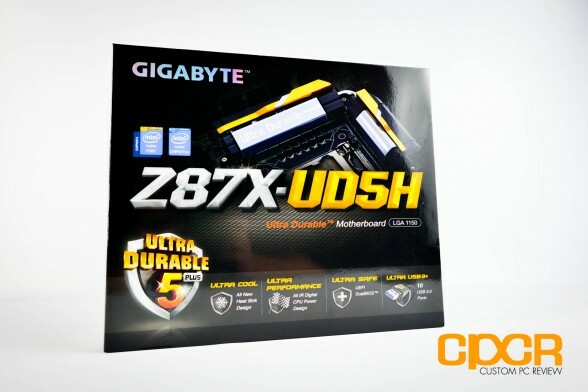 Among the features of the Gigabyte Z87X-UD5H is that it now supports their Ultra Durable 5 Plus specification, which is a set of feature and component choices which help give Gigabyte boards better performance and a a longer lifespan. 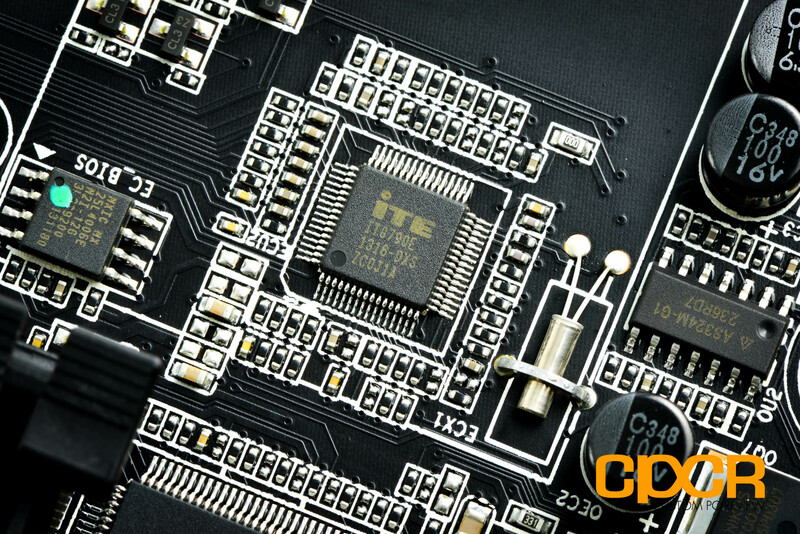 The CPU socket is sporting 15µ gold plated pins, which help reduce corrosion and long term reliability. The PCB itself is sporing 2x the copper which allows the board to handle greater power loads and lower heat from the CPU/VRM area. 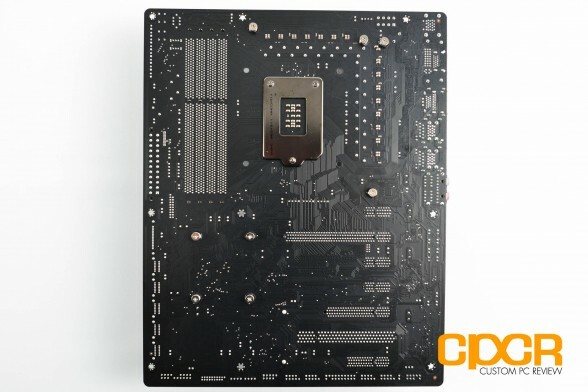 There’s also the new and improved heatsink as well which as you can see here is probably one of the largest, most aggressive heatsink designs we’ve seen from Gigabyte for their Zxx-UD5H series boards. We really like the new smooth heatsinks as they provide a sleeker look in comparison to the older finned heatsinks used in practically every generation in the past. Up at the top left corner, we get one 4 pin fan header, and right below the CPU socket, we get three more 4 pin fan headers. Removing the heatsink, we uncover a couple additional features as well. The board features a massive, massive 16 (12+2+2) phase digital power delivery system powered by both IR (International Rectifier) PowlRstage ICs and IR Digital PWM controllers. 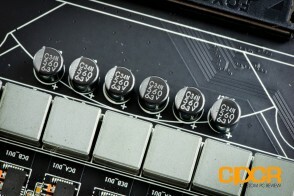 All capacitors onboard are blacked out Nippon Chemi-Con Japanese capacitors rated at 10,000 hours at 105°C. 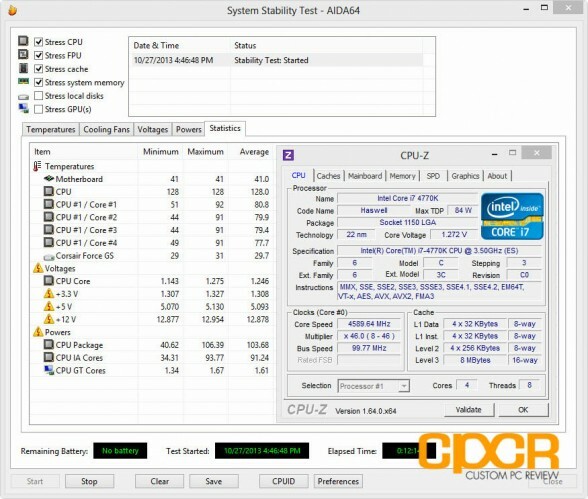 As expected for a Z87 motherboard, there are four DDR3 DIMM slots which supports overclocked frequencies of up to DDR3 3000MHz. The DIMM slots are color coded in pairs as well since memory needs to be installed in pairs to take full advantage of DDR memory. At the edge of the board, we’ve also got a 24 pin power connector, 4 pin fan header, USB 3.0 header, debug LED, onboard power/reset/clear CMOS buttons, physical BIOS switches, and voltage check points as well. 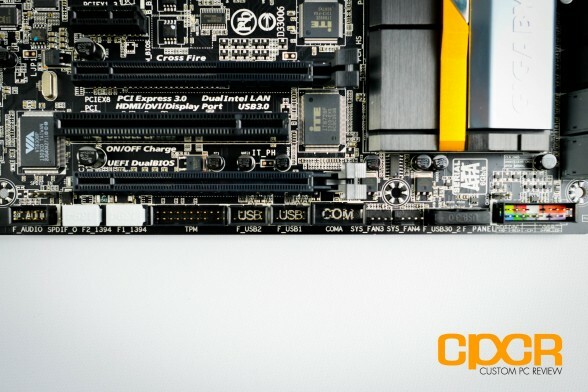 For storage, the Z87X-UD5H includes a total of 10 SATA 6Gb/s connectors with six running off the Intel Z87 chipset (black) and four running off a Marvell 88SE9230 PCIe controller (grey). 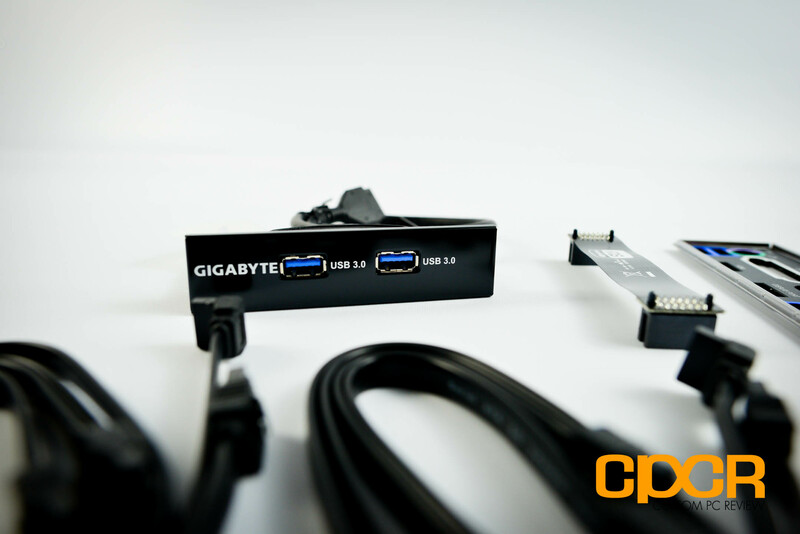 Additionally for those running high powered GPUs or multi-GPU configurations, Gigabyte has also included a PCIe power connector to deliver additional power to the PCIe slots if needed. The Gigabyte Z87X-UD5H includes three PCIe x16 slots with one wired for x16, one wired for x8 and one more wired for x4. There’s also three PCIe 1x slots and a single legacy PCI slot here as well. The top and the middle PCIe x16 slot is controlled by the processor and since Haswell processors only support up to 16 PCIe 3.0 lanes, the slots will operate in x8/x8 if two graphics cards are installed. 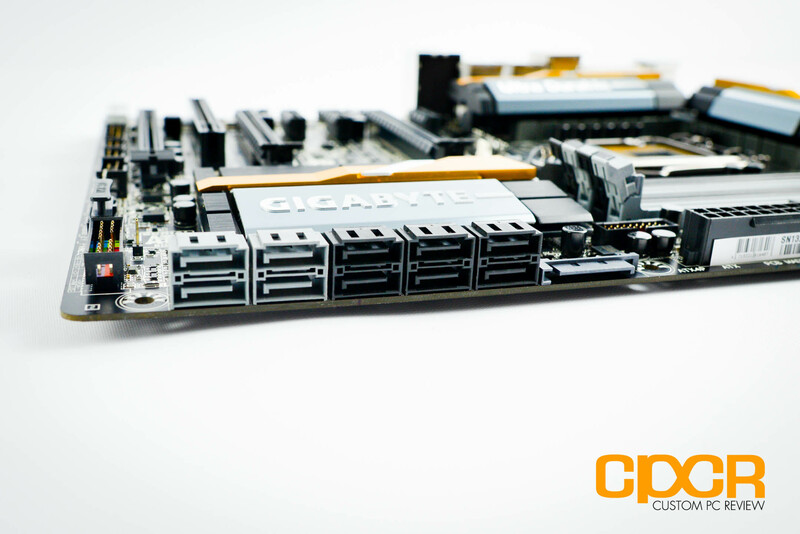 The bottom PCIe slot is controlled by the chipset which supports up to 4 lanes of PCIe 3.0 goodness. Unfortunately, this means when the bottom PCIe x16 slot is used, the PCIe 1x/PCI slots are disabled. 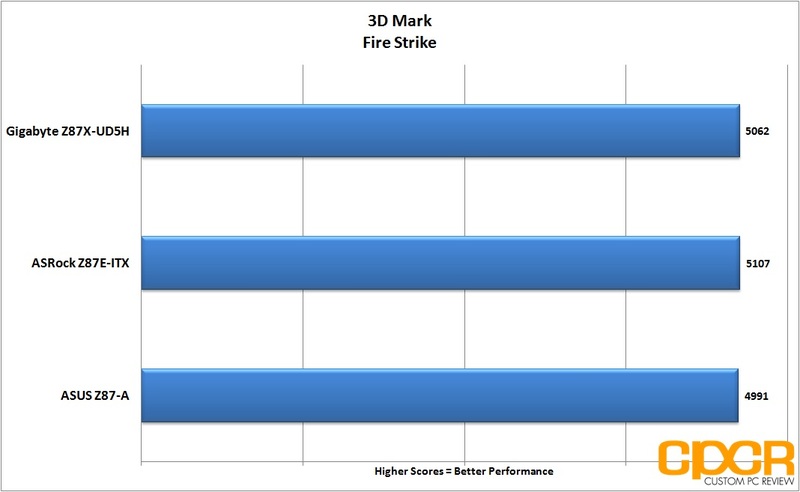 The Gigabyte Z87X-UD5H supports up to two way SLI/CrossFire. Embedded between the expansion slots is also two MXIC BIOS chips, another feature of the Ultra Durable 5 Plus specification. 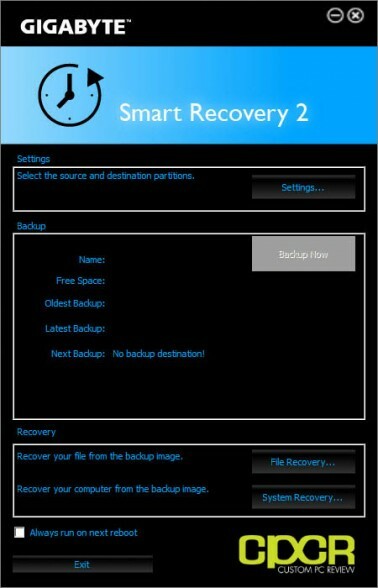 This allows recovery if for some reason your BIOS fails such as in the case of a bad overclock or a corrupt BIOS. For voltage and temperature monitoring, Gigabyte is using the ITE IT8728F Super I/O chip. 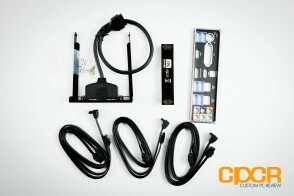 On the left of the expansion area, we get Gigabyte’s choice for integrated audio – the Realtek ALC898 audio. The Realtek ALC898 is a fairly standard eight channel chipset that a number of motherboard manufacturers use. 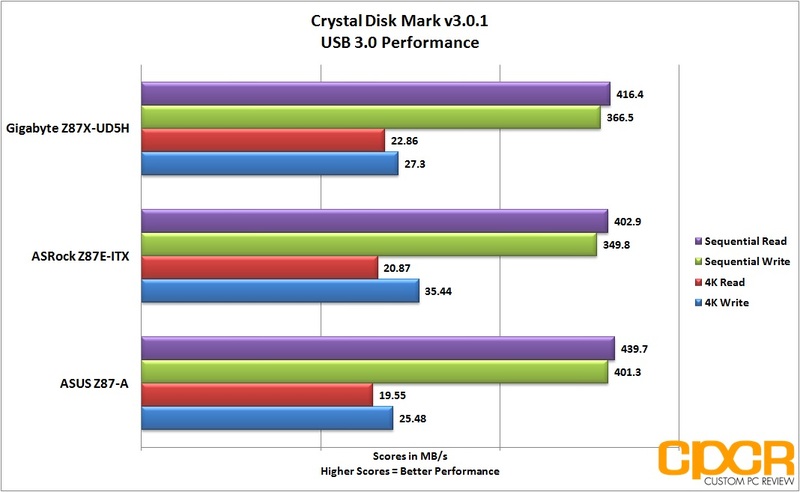 Unfortunately, there’s no special audio oriented capacitors, no barriers, and no special audio chip to improve audio. It’s pretty strange Gigabyte hasn’t done much here, especially since they do so much for the Z87 Sniper series gaming oriented motherboards. The only special add-on is the inclusion of the TI DRV632 amp, which is capable of driving up to 600 ohm headphones. That said, there’s plenty of expansion options available for those looking to drop in a high quality sound card. 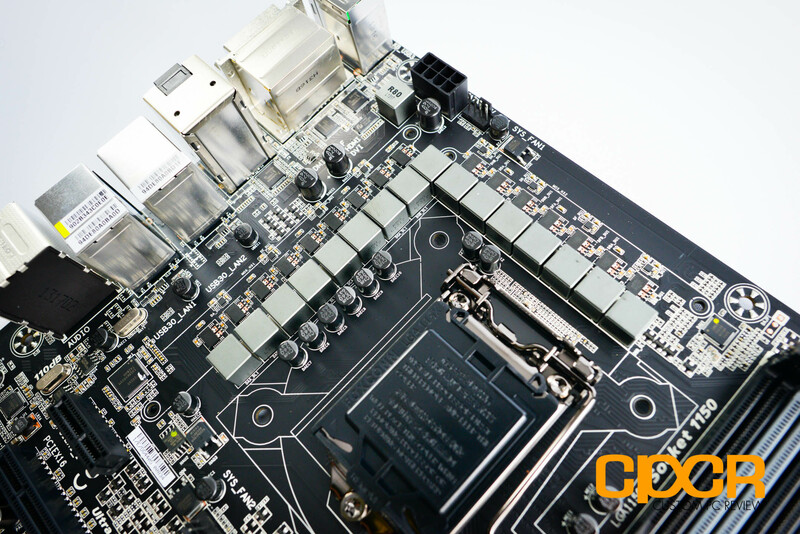 Here’s a look at the bottom edge of the Gigabyte Z87X-UD5H. 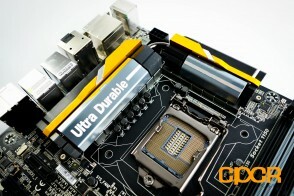 Gigabyte has included a ton of front panel headers here. 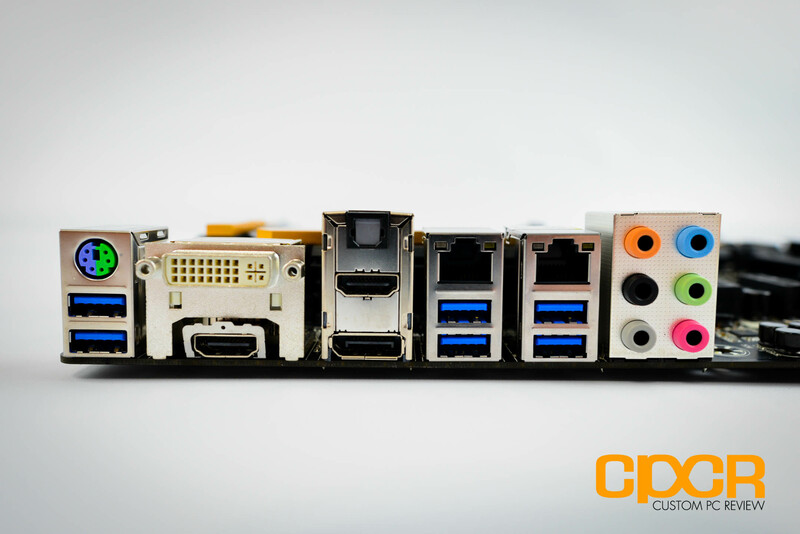 Starting from the left, we get the front panel audio, two IEEE 1394a headers, a TPM header, two USB 2.0 headers, a com port header, two fan headers, a USB 3.0 header, and the front panel header. Moving onto the rear I/O, we get a PS2 keyboard/mouse combo port, 6x USB 3.0 ports, a DVI-I port, 2x HDMI ports, a DisplayPort, an optical out connector, 2x Intel Gigabit LAN ports, and 7.1 channel audio jacks. Flipping the board around the back, there isn’t much to see here. 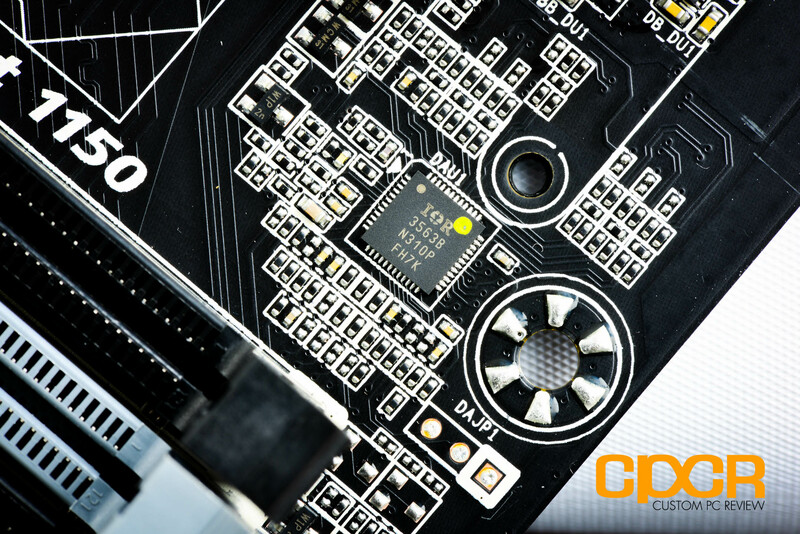 As usual, Gigabyte’s soldering and traces are impeccable and all heatsinks are mounted via metal screws rather than cheapo plastic. 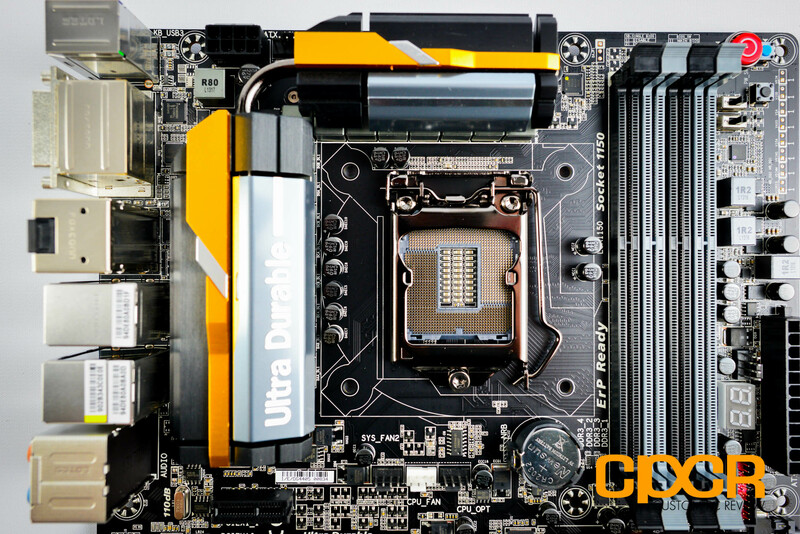 New generation motherboard, new UEFI BIOS and the latest design from Gigabyte is definitely among their finest work we’ve ever seen to date. In stark contrast to the newbie friendly (and very gimmicky) 3D BIOS introduced a couple generations ago, the latest UEFI BIOS is actually quite useful with tons of information available to the user right from the home page. 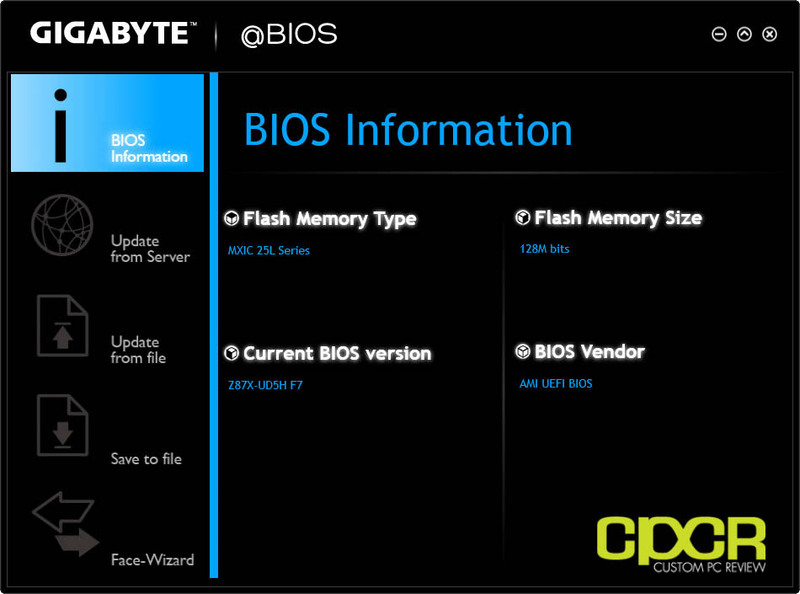 What’s interesting about Gigabyte’s new take on the home page is that any option available in the BIOS can be customized to show up here. This means you can set voltages, multipliers, phase controls, and boot options to show up all on the same first menu item to make it easy to quickly tweak some commonly used settings. You can also change the color of the home page and you can change the page the UEFI defaults to in case you don’t like the default home page. 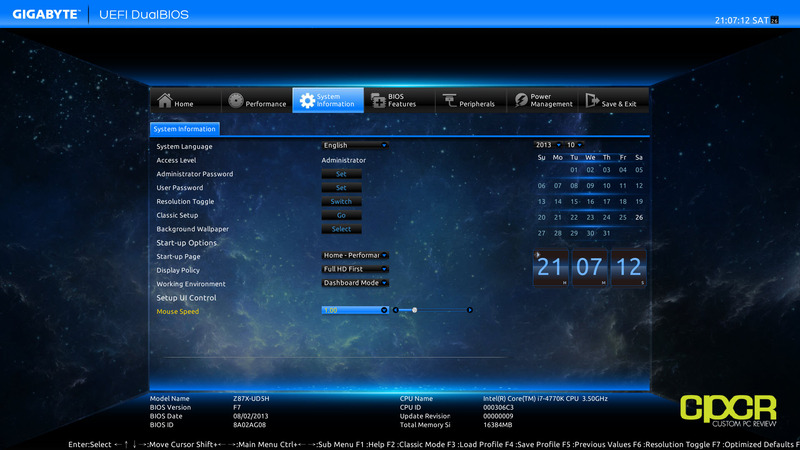 Next up we also have the performance menu, which allows adjustment of overclocking settings. 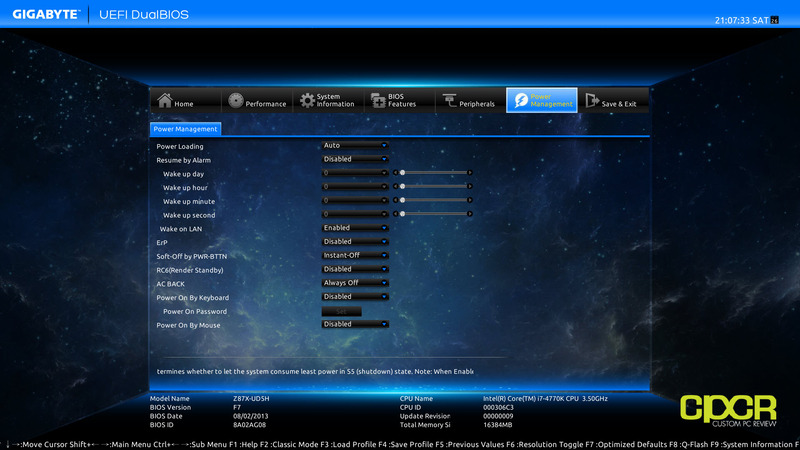 Gigabyte makes it pretty easy to adjust any of the options and there’s also decent descriptions that go along with the options as well. 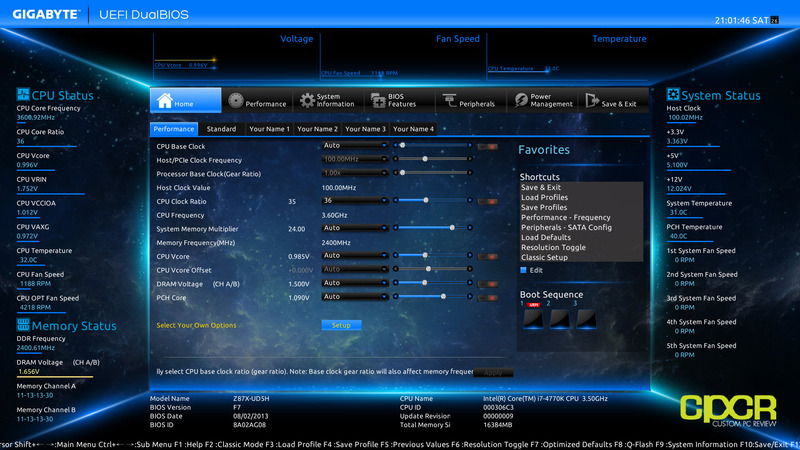 That said, I did notice that some of the descriptions for the settings are curiously missing, but the missing descriptions are mostly options used for more advanced overclocking. 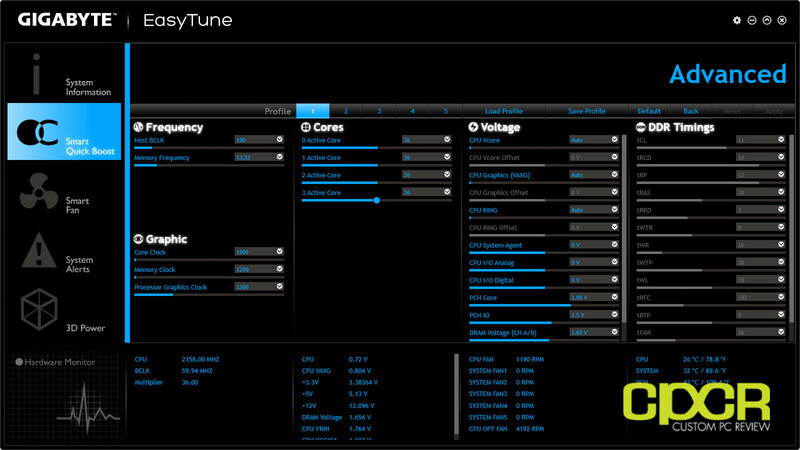 In the performance menu, we also have the fan control menu, which allows fine tuning of the 7x fan headers on the motherboard. 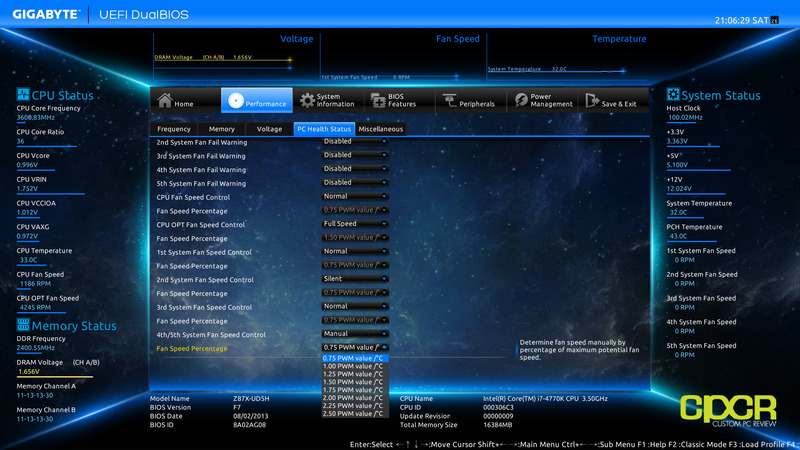 Within the UEFI, there’s actually only very basic options for fan controls which include a normal mode, a performance mode, and a full speed mode. 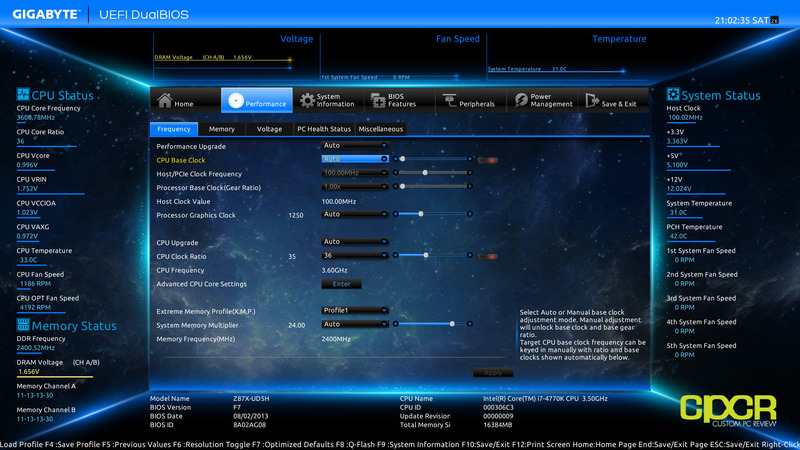 Unfortunately, there’s no fine tuning fan profiles to run at certain RPMs for certain temperatures – a feature that’s offered with motherboards from vendors such as ASRock and ASUS. 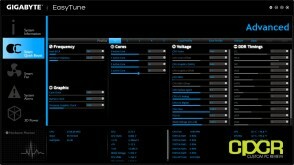 That said, the more granular controls are avialable in the EasyTune software as you’ll see later on in the review. 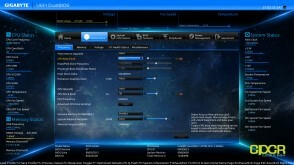 Here’s a look at some of the other settings available in the UEFI BIOS. The options in the UEFI BIOS is pretty standard for Z87 based motherboards across the board, so there isn’t anything too special going on here. One thing to note is that while Gigabyte does have the QFlash BIOS update utility onboard, you don’t have the option of updating the BIOS right over the internet. You’ll either need to preload the BIOS onto a flash drive or update it using the @BIOS utility in Windows. Personally, I think Gigabyte’s latest UEFI BIOS is possibly the first usable UEFI implementation I’ve seen from the company, but for those who disagree or those who are just simply old school, you can go with the classic BIOS, which may be accessed by simply hitting F2. 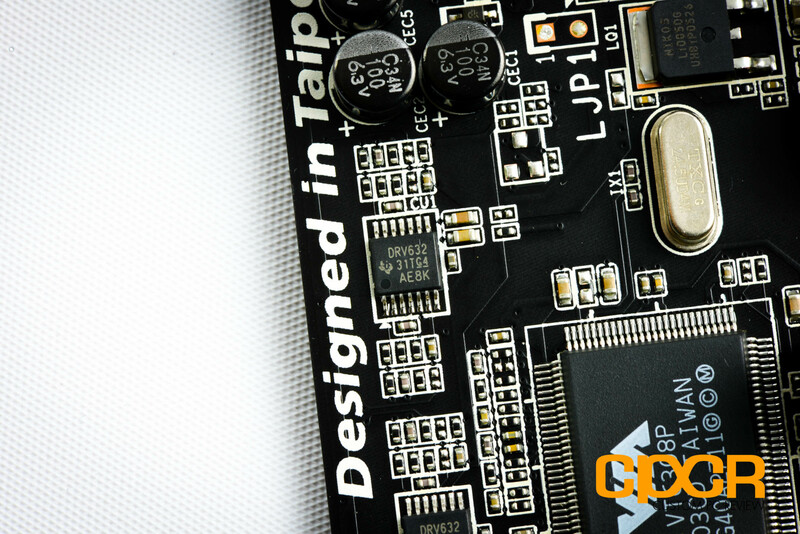 With the Z87 chipset generation motherboards, Gigabyte has revamped the software to give everything better usability and give it a more unified look across all software along with the UEFI BIOS. To organize the software, Gigabyte has included the APP Center, which is a launcher software for Gigabyte’s software. Let’s take a look at what’s included. 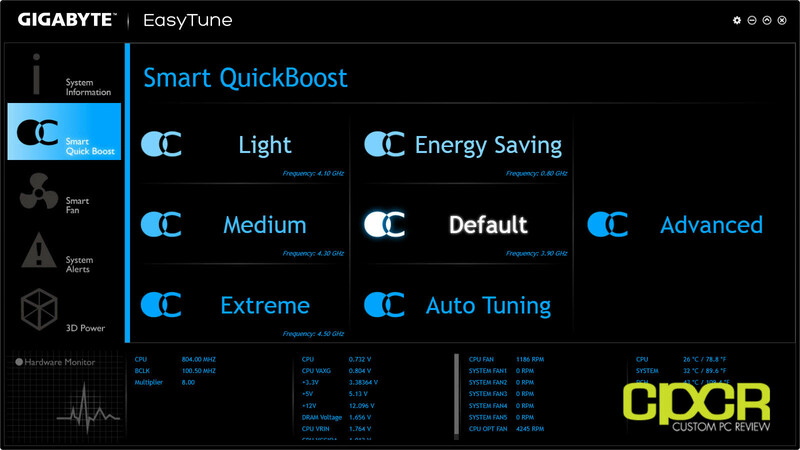 Like the rest of the software, EasyTune has gotten a huge makeover, which is an awesome thing. 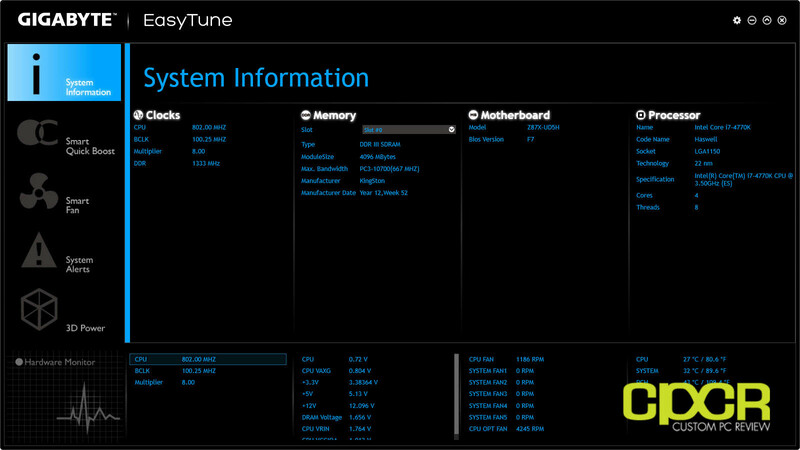 The latest iteration of EasyTune will now simply be known as EasyTune rather than EasyTune along with a version number. Upon first launch, it’s noticeably faster to launch and to navigate than the older versions of the EasyTune software. 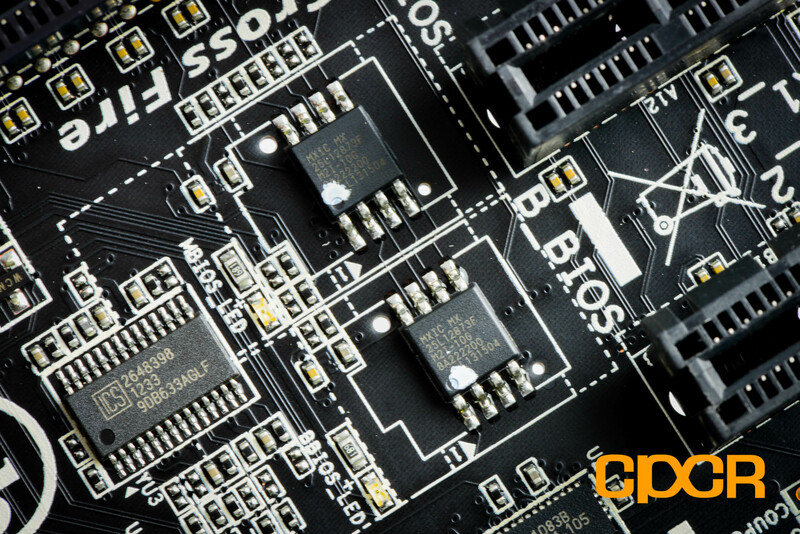 On the home page, the software now displays a wealth of information such as the frequency of the CPU, voltages, memory information, BIOS information, and more. 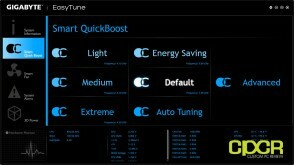 Moving into the Smart QuickBoost section, Gigabyte makes it pretty easy for users to just go in and autotune their systems to preset profiles. The profiles are decent, but more often than not, they use excessive amounts of voltage to achieve overclocks that you can do manually for less. 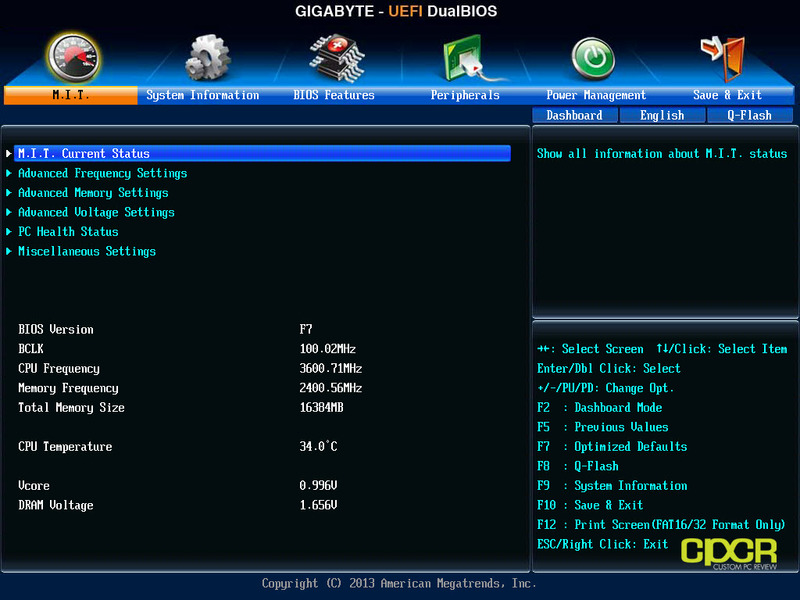 There’s also an advanced section that allows you to adjust pretty much every setting available in the BIOS. What’s cool here is that if you do find a decent setting, you can go ahead and save it directly to BIOS right from the software – something not previously available via the older EasyTune softwares. 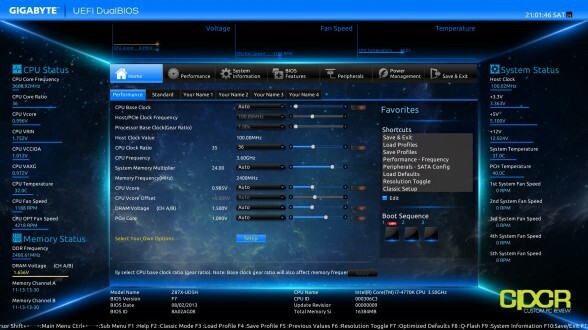 Additionally there’s also SmartFan, which allows you to choose between a number of profiles or go into the advanced mode for more granular controls. 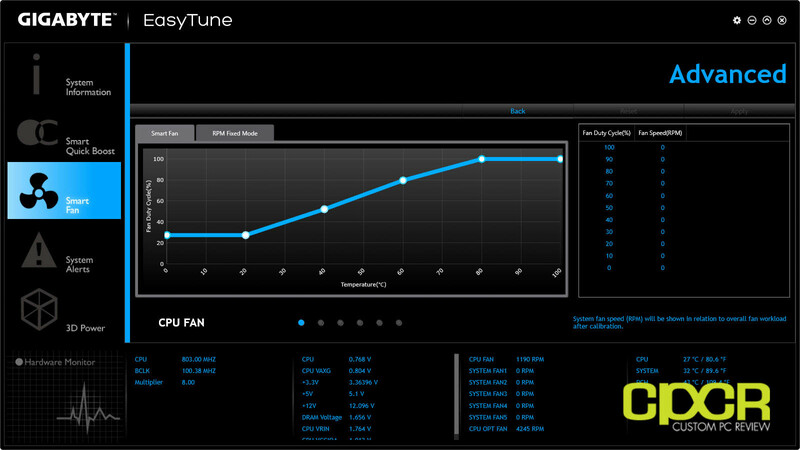 This allows precise tuning of the fans so that you can have the fans run at certain speeds at certain temperatures. For some reason this feature isn’t available directly in the UEFI BIOS, but it’s great to see that it’s still there for those who are really interested in having it. 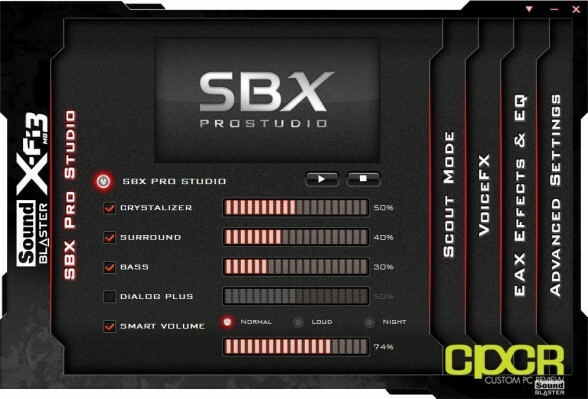 While Gigabyte relies off the Realtek ALC898 audio chipset to deliver audio, Gigabyte also includes the Creative Sound Blaster X-Fi3 software which enhances audio using Creative’s suite of audio processing softwares. That said, you’re still only getting Realtek ALC898 integrated audio quality and all of the processing happens on the CPU rather than a dedicated audio chip. ON/OFF Charge 2 is pretty self explanatory. 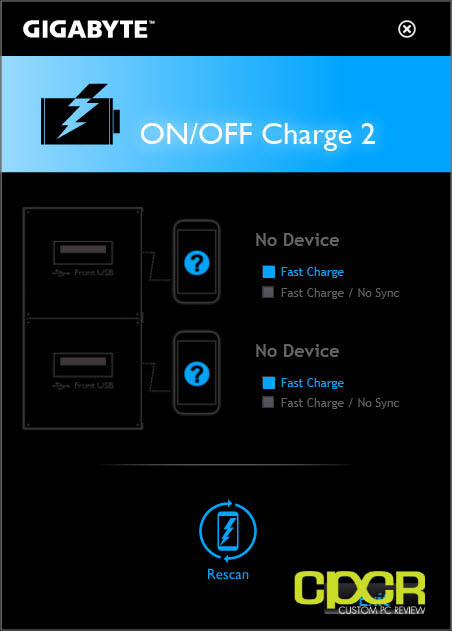 You can choose for the motherboard to either have fast charging or fast charging and no syncing. Cool. Fast boot is a new feature that’s pretty much for Windows 8 and newer motherboards. 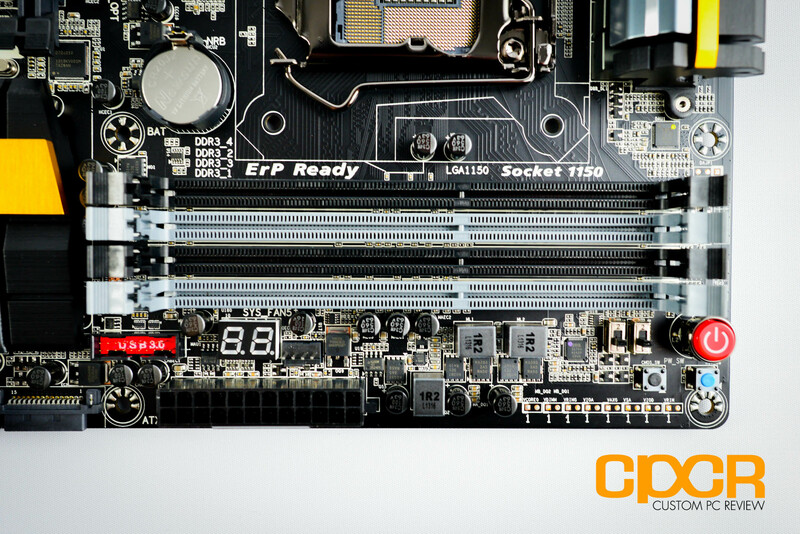 It allows the system to streamline the UEFI BIOS so that you can boot quicker, but unfortunately it either makes accessing the UEFI BIOS very difficult or impossible. With this utility you can enable fast boot and you can enter the BIOS easily using the Enter BIOS Setup Now feature. Gigabyte also includes USB Blocker, which I think is more of a feature used for public computers rather than for personal ones. 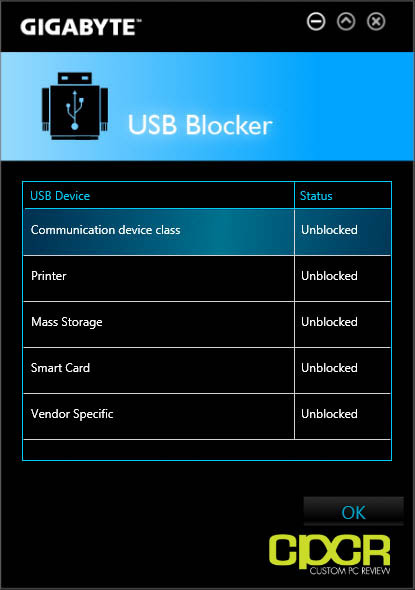 This allows blocking of certain features such as USB ports, printers, mass storage, etc. 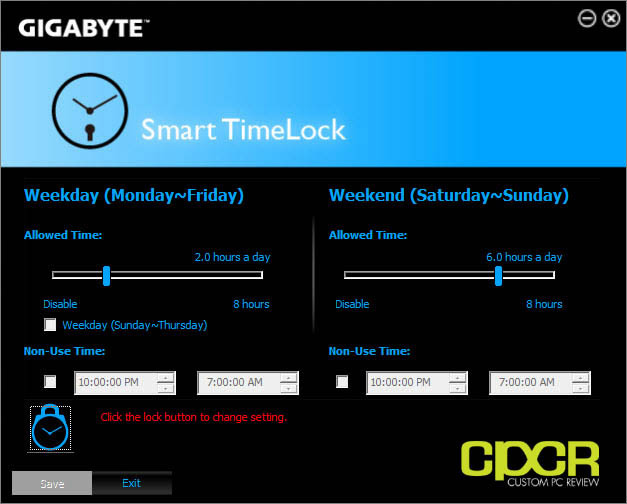 Smart TimeLock is pretty self explanatory. You can set it so that the system can only be used for a certain number of hours a day and you can lock the system as well. 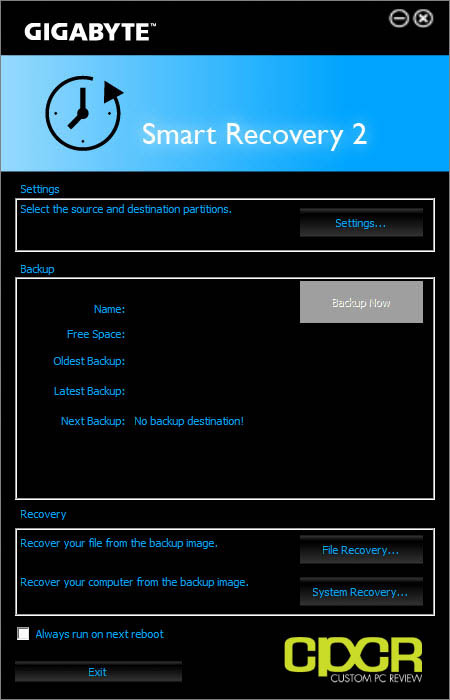 Smart Recovery 2 allows you to automatically setup backups and restore those backups as well. 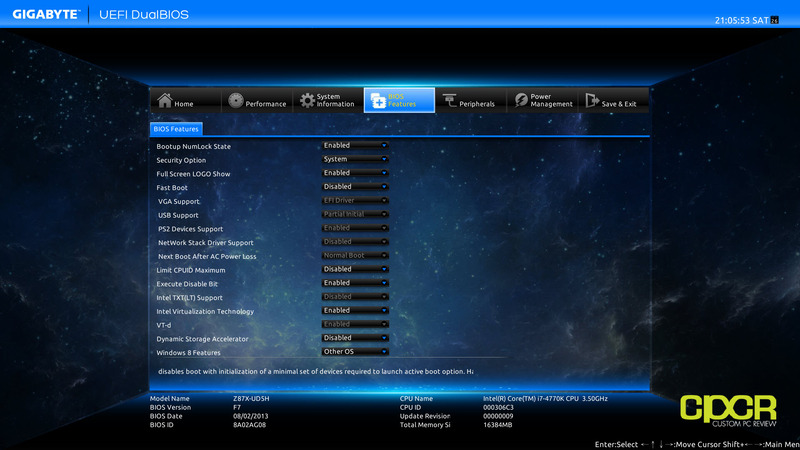 @BIOS allows updating the BIOS right from within Windows. Updates can be downloaded from Gigabyte’s servers or you can update from a file. 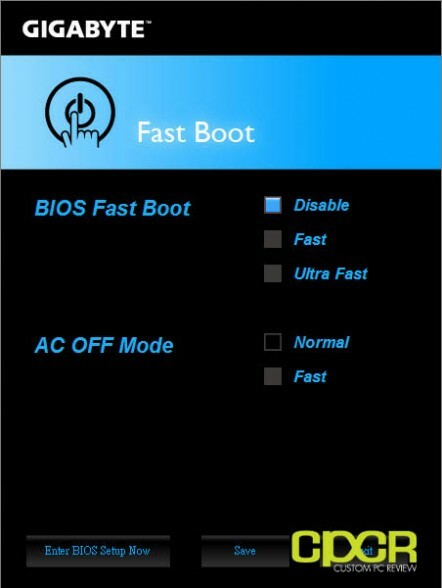 You can also save your current BIOS to a file and you can change the BIOS boot up image as well. As usual, Gigabyte also has Live Update, which helps you keep all your software up to date without having to go to Gigabyte’s website. Live Update automatically checks for new updates from Gigabyte’s website then you can choose which updates you want and it’ll automatically download and install them for you. 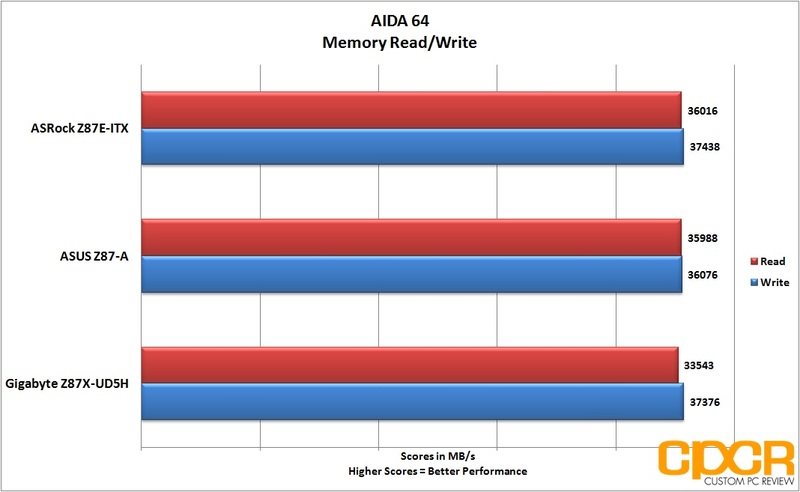 For storage performance testing, we’ll be using a fresh Samsung 840 EVO 250GB SSD. This will allow us to fully saturate the SATA 6Gb/s ports on the motherboards. For USB 3.0 testing, we’ll additionally be using the Thermaltake BlacX 5G USB 3.0 dock, which is one of the few USB 3.0 docks on the market that currently supports the UASP protocol. 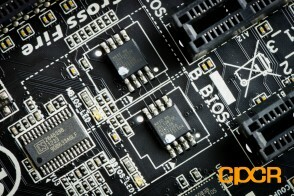 Since motherboard performance is mostly dependent on other components and with some manufacturers purposefully tweaking the BIOS from the factory to get a couple extra MHz out of the CPU to run just slightly faster than competitors, our main goal with motherboard performance testing is to ensure that the motherboard doesn’t have any blaring issues. Looking at our figures above, the Gigabyte Z87X-UD5H is capable of similar performance compared to the competing motherboards tested today. 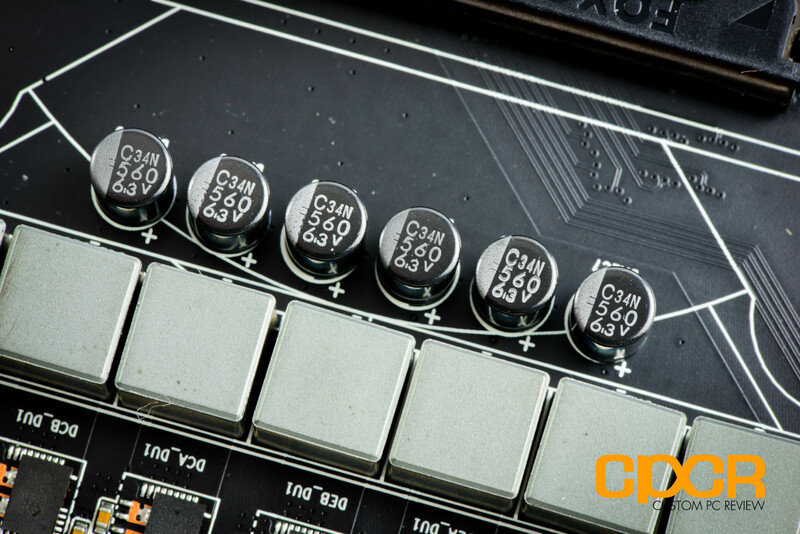 Since the Gigabyte Z87X-UD5H is based off of Intel’s Z87 chipset, the motherboard fully supports overclocking of any K series Haswell processor. In our testing, the Gigabyte Z87X-UD5H was quite easy to overclock actually and for those with little to no overclocking experience, all you’ll need to do is either use one of Gigabyte’s preset profiles or simply up the multiplier without changing any settings and voila. Overclocking complete. That said, with an auto overclock to 4.6GHz, the motherboard pushed 1.38v, which will overpower pretty much any air or AIO water cooling solution, so that’s probably not so much of a good idea. Instead, we manually tinkered with our system and reached 4.6GHz with a maximum voltage of 1.275v, which is a decent 24/7 overclock since we don’t really have a great overclocking chip in house. Our overclock was reached by basically adjusting all turbo multipliers to 46, changing the Vcore to normal mode, and changing the Vcore offset to 0.080v. That’s it. 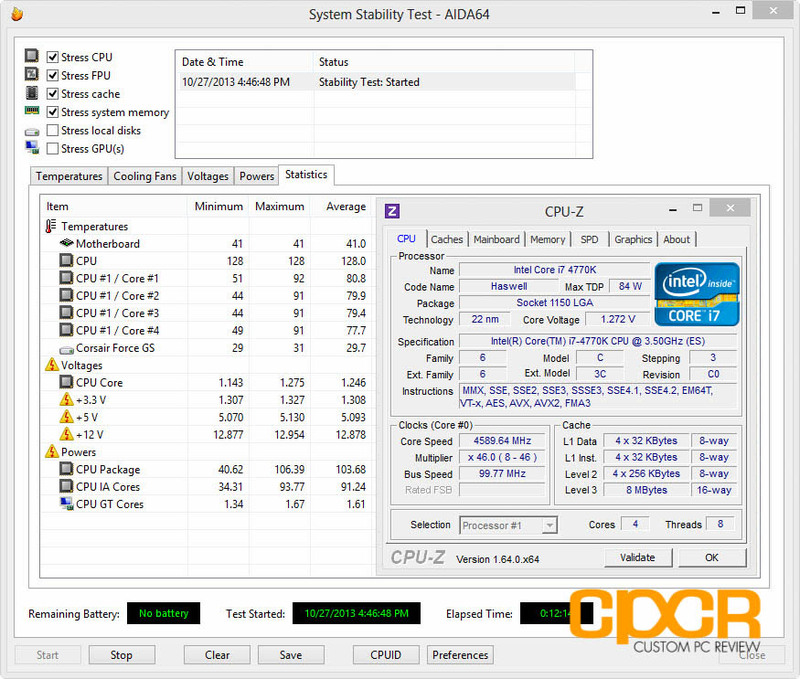 This setup was stable for a couple hours of AIDA64 stress testing although you can see above that it’s probably not wise to keep that as a 24/7 overclock for those with the same/similar cooling solution as what we have running in our test bench. During load 4.6GHz at 1.275v was able to reach the low 90°C’s, which isn’t recommended for long term use. Given the amount of features onboard the Gigabyte Z87X-UD5H, we expected a bit more power consumption than the other boards in our lineup and that’s pretty much what we saw. 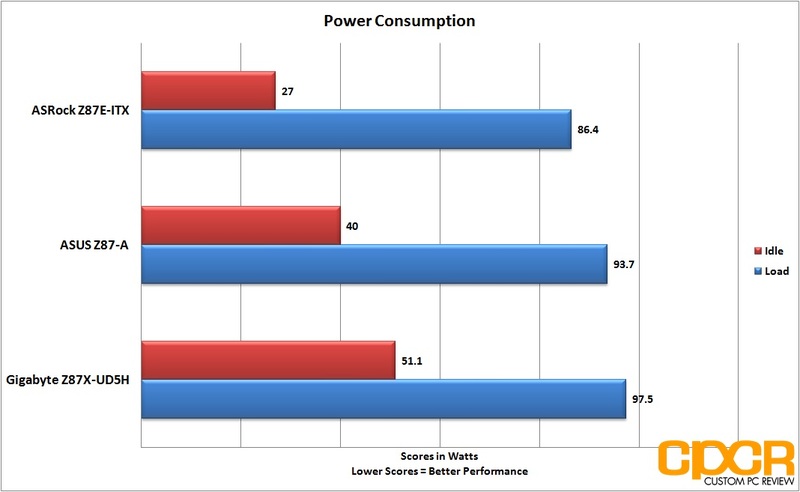 With all the default settings enabled, we measured 51.1w idle power draw and 97.5w load power draw, which is slightly higher than the 40w idle/93.7w load power draw from the ASUS Z87-A and significantly higher than the 27w idle/86.4w load power draw from the mITX formfactor ASRock Z87E-ITX. 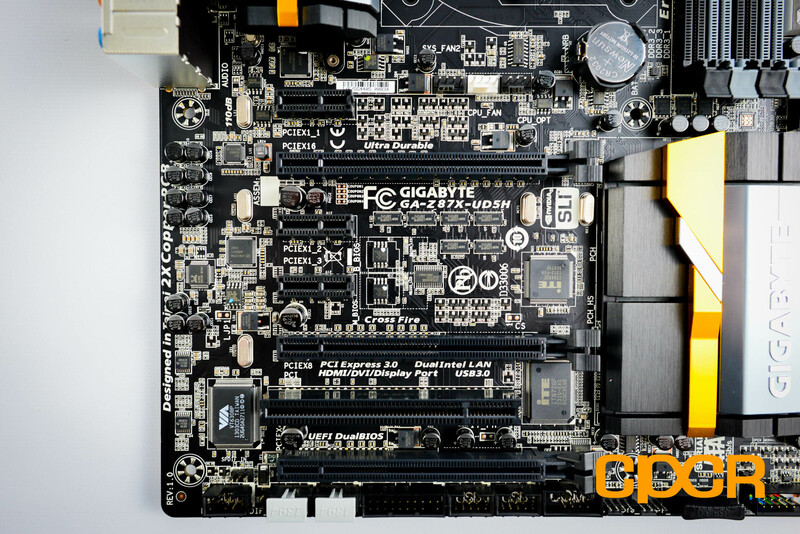 Gigabyte’s motherboard offerings over the past couple generations have been quite good, easily ranking some of its products among the best motherboards on the market and the Z87X-UD5H reviewed today is no different. 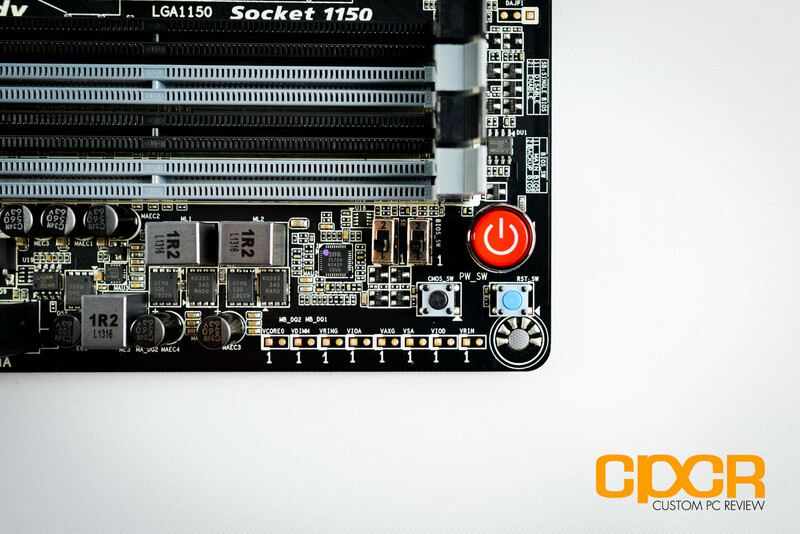 With the latest generation boards, Gigabyte’s board board designs have really gotten to a new level of refinement that hasn’t necessarily been quite “there” in previous generations. 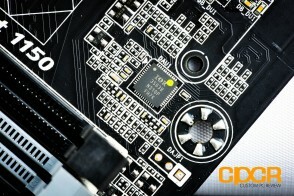 The strong point with the newest motherboards is the design and layout. 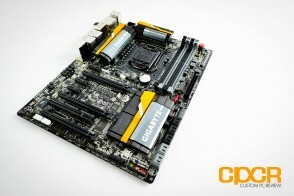 Gigabyte has simply done a great job with the Z87X-UD5H. All motherboard connectors are placed in the correct spots at the edges of the board, there’s plenty of fan headers available (all 4 pin to boot), and there’s ample spacing between the PCIe slots for even the thickest triple slotted graphics cards. 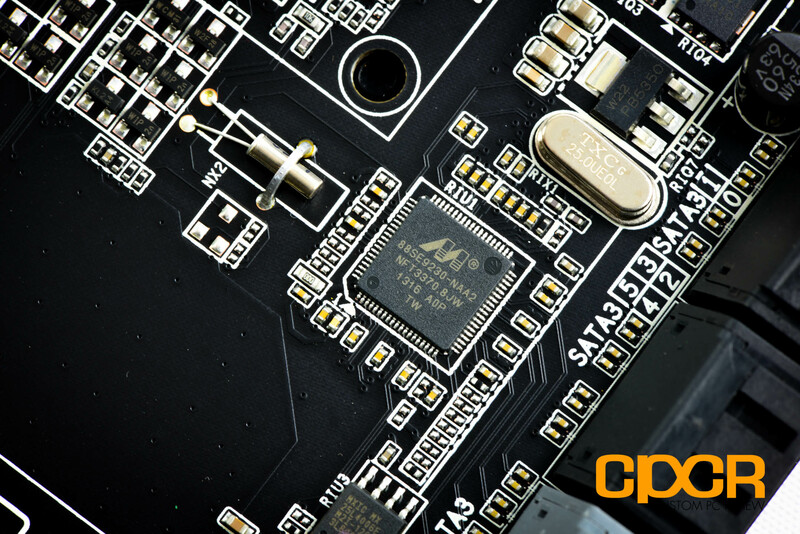 Those looking to use the board for tweaking and testing on a bench will also find that onboard power/reset/clear CMOS buttons are extremely useful and onboard voltage check points will allow overclockers to dial in precise voltages as well. 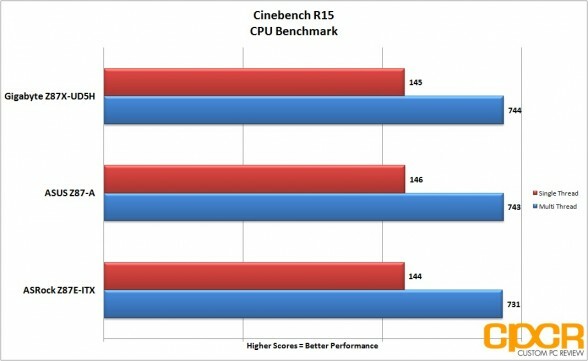 The only slight concern you’ll have is to watch out for is CPU cooler compatibility since the VRM heatsinks are quite massive. That said, we didn’t have any issues fitting the water block from our CoolIt AIO water cooler and most larger CPU coolers with a decent amount of clearance shouldn’t have any mounting issues. 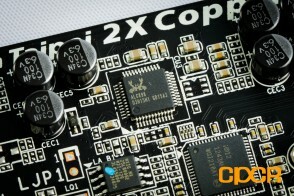 Speaking of the the heatsinks, the Z87X-UD5H is an absolutely gorgeous motherboard. I remember the first time I saw the Z87X-UD5H at a Gigabyte motherboard event and prior to even seeing complete list of features on the board, I was already extremely impressed. Whereas the last couple generation Gigabyte motherboards already looked quite decent with the blacked out PCBs, I think the Z87 boards really take the cake. The blacked out PCBs paired with the new accented solid block heatsinks are simply fantastic and the gold/silver accents on the Z87X-UD5H gives the board that classy look that I think works extremely well here. 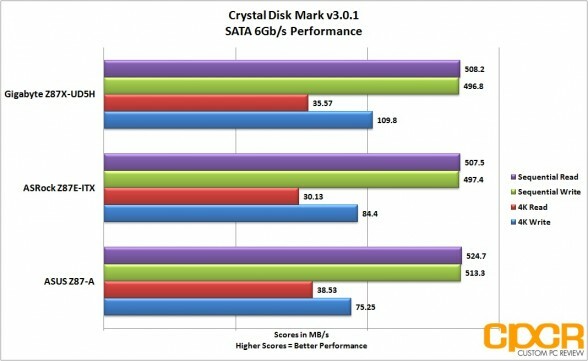 Those sporting windowed cases will definitely like what Gigabyte has done. As far as the BIOS, I definitely like what Gigabyte has done moving away from the clunky and limited 3D BIOS to the new UEFI BIOS we’re greeted with today. I think it’s a much more effective interface that’s designed with enthusiasts in mind rather than something designed for people who need a graphical representation of the motherboard to understand the options. That said, in line with what I saw from some reviews floating around online, the new UEFI on the Z87X-UD5H was sluggish at first (our sample shipped with the F5 BIOS), but once updated to the F7 BIOS, it was a night and day difference. It’s not perfect by any means just yet as I still experience some issues while navigating the BIOS, modifying settings and for some reason my keyboard will do some funky stuff, but for the most part it’s pretty solid. Since it’s a completely redesigned UEFI, I think it still has a bit more maturing to do, so it’ll really be up to Gigabyte’s BIOS team here. 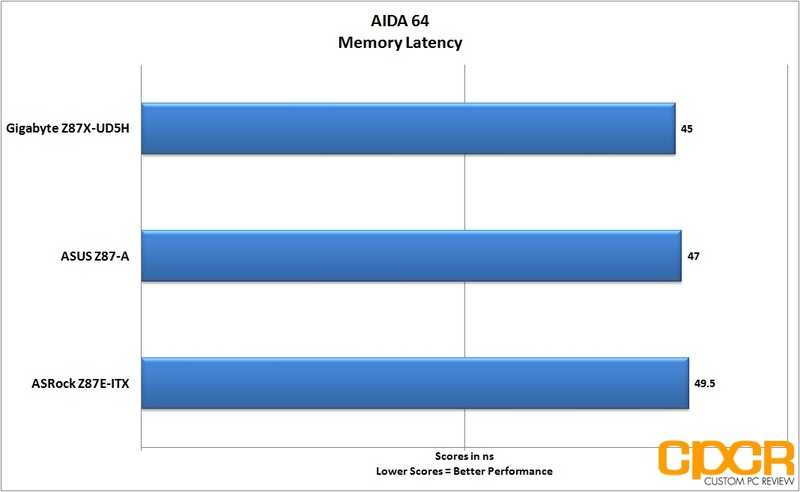 That said, I really wish Gigabyte shipped the boards with the F7 BIOS in the first place then worked off that. 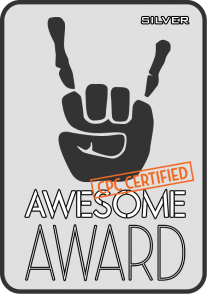 Would’ve resulted in a lot fewer less than favorable comments online, but with shipping schedules and deadlines, it’s always better late than never. The Gigabyte Z87X-UD5H is currently priced at $199.99 (Amazon), which I think makes it a superb value for the amount of features Gigabyte has crammed onto the board. If Gigabyte’s BIOS team is able to provide regular BIOS updates over the next couple months to bring the BIOS to the level of refinement we see from ASUS’s BIOS implementations, the Z87X-UD5H can seriously be a contender for the best $200 class enthusiast motherboard on the market. Unfortunately it’s close and I’m sure it’ll get there, but it’s not quite there today. Luckily, BIOSes can be updated, whereas poor hardware design cannot. Ever since the Z77 series, we’ve really seen a paradigm shift from Gigabyte as they’ve been able to offer a ton features for extremely competitive pricepoints and I think it’s a huge win for the consumer as a whole. Enthusiasts looking for a quality motherboard with tons of features, tons of expansion options, and tons of overclocking potential for under $200, be sure check out the Gigabyte Z87X-UD5H.